This June, we had a lot of rain in New Mexico. It made for an extraordinarily lush scene for bridal portraits at the ABQ Biopark. One afternoon when I had taken my tot to enjoy the ducks and butterflies, I saw this while she ate her lunch at a nearby bench. 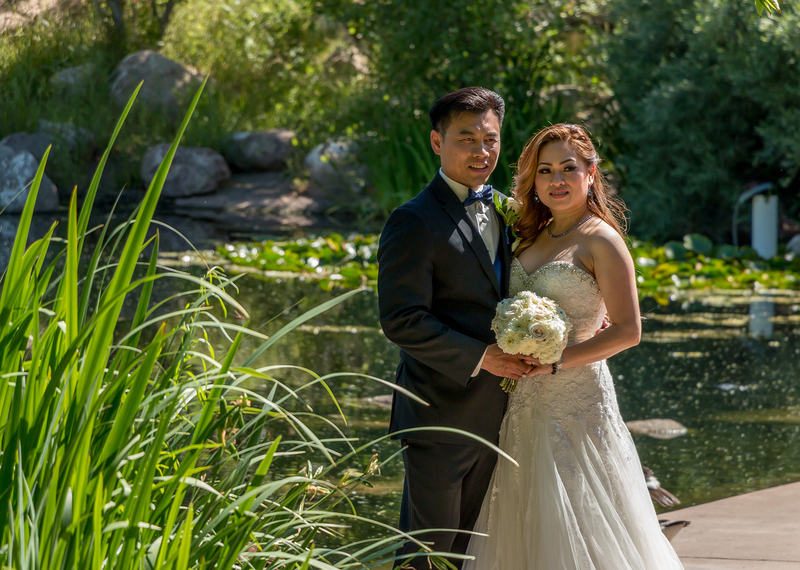 A bride and groom who literally had just tied the knot, walked gingerly to the duckpond with a professional photographer to take a wedding portrait. The new husband carried his new wife’s wedding bouquet, and guided her carefully down a few short stairs to reach the edge of the pond. She was in high-high-heels and lifting up her skirt’s edge to avoid tripping on and ripping her gown. I witnessed, and captured here, the husband’s first thoughtful, caring act towards his wife. May they be blessed and this be the start of many loving acts towards each other, right? When the couple reached the spot where the photographer liked the background, they turned around and faced him. I was just steps away. Already making photographs of my toddler, I was ready to make my own portrait of this couple. We were in public, afterall, so why not piggy back on the pose made for the real pro? Their photographer was standing more to their broadly lit side, and his background would have been the one seen as she was helped down the stairs in my earlier photograph. I particularly liked my own take, of course: with the reeds on the side for some foreground framing. This brief scene reminded me of an experience from a figure drawing course that I took twenty years ago. Obviously, it left an impact on me since I remember it to this day, and consider it now and then while making photographs. One of my favorite parts of the drawing class was at the end of a timed session, when all students would reveal their finished sketches to the rest of the class. Everyone had been set up around a model in the center of the room. The individual drawings were always interesting to compare. The drawings were made from different vantage points of the same model being viewed from different heights, different angles. There were as many points of view as there were students. Instead of drawing our subjects, as photographers we are clicking our shutters to capture them. Certainly, if time permits, it can be very useufl to capture the subject from various points of view, from different angles, positions and lens orientations. You might, for example, establish a routine of starting off with a horizontally framed subject, then shift the camera to a vertical framing. Perhaps you start out by looking up while kneeling, or your use a step ladder to look down upon the subject, having the subject change the position of their gaze at you, if it is a portrait. When you review your images, especially if using a shallow depth of field, you may be surprised to see how the shapes in the background change. Some details in the periphery will ebb and flow in and out of the bokeh field of your background. Play with the focus and depth of field. Assuming your camera exposures and focus are done correctly, you might have taken your favorite shot from the alternate viewpoint.